In 2015 I spent my New Years Day working! Some would frown on that but, I was full of excitement because I was starting the New Year working on my new business. Moreover, I would be witnessing two people in love getting married. Lori Levine & Jan van Arsdale had the most amazing day! I have never felt such love in the room whether I was in the Bridal suite with Lori and her girls or in Jan’s room with the guys, each room was filled with love! It moved me. I was very at peace in the presence of these two. Fast forward to 2016 and Lori presented me with a fantastic gift! Her wedding was being featured in Martha Stewart Weddings! Woohoo! Please follow the link below to see their beautiful day. Also, take a look at this amazing video . It gives you a real peek into this amazing day. Look closely and you can see yours truly doing her bridal styling magic! What a way to start the year! Please see our menu of services and tell all of your engaged friends about us. Here’s to seeing you down the aisle! http://idoidoidony.com/wp-content/uploads/2015/01/iDo-Logo-retina.png 0 0 Sadia Seymour http://idoidoidony.com/wp-content/uploads/2015/01/iDo-Logo-retina.png Sadia Seymour2016-01-20 16:21:242018-06-26 17:16:11What a way to start the New Year! As a Bridal Stylist, I am privy to being involved in very intimate details of a Brides special day. There are traditions that are cultural, that I enjoy learning about and experiencing. Some are religious, which I find fascinating. Others are family traditions like using a grandmothers wedding band during the ceremony. Then there are traditions we grew up hearing about and only learn their true meanings till our own wedding day like “Something old, something new, something borrowed, something blue”. (“Something blue” represents love, purity and fidelity.) I’d like to share a “Blue” trend that I am seeing more often and I really love. 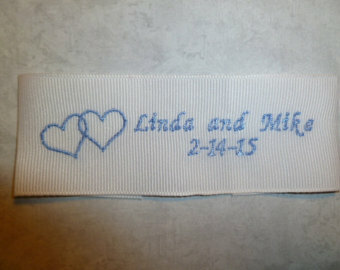 Lots of Brides are taking the “Something Blue” part of the tradition and having their wedding dates, names and dates & initials and dates embroidered on the hem of their dresses in the lining. 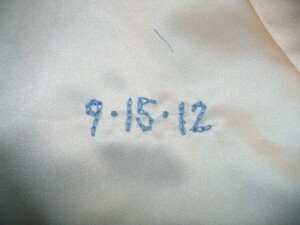 I think this is so special and instantly makes it an heirloom. 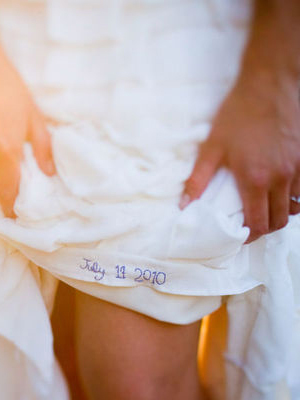 The above photos are a nice simple way to commemorate your wedding day. Here are some fancier options. 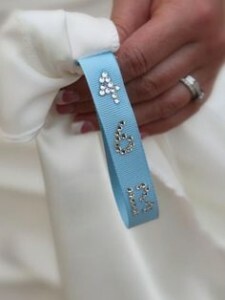 For the Bride who likes a little bling, there is the ribbon loop with crystal numbers. So chic! 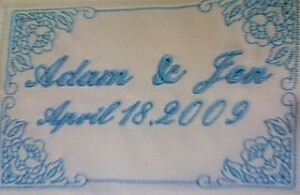 Whatever your style, try this new take on your “Something blue” and make new memories and traditions. Do you have a traditional or unique “Something blue”? Tell me about it. Welcome to I DO I DO I DO! I DO I DO I DO is the business of my dreams! I began brainstorming about it after a conversation with a makeup artist friend of mine. He worked with Brides and said that I should offer Brides my expertise of Fashion Styling for their weddings. It sounded great but, I didn’t know where or how to start. I wrote a business plan in 2009 to flesh out the details, completed it but, still had no idea on how to reach my Brides. I put the business to the side and just continued my freelance work as a Fashion Stylist. Fast forward 5 years later and I got a call from a colleague that she knew a Bride who was looking for a “dresser” for her wedding. Eureka! This was exactly what I had been waiting for! I reached out to the Bride, Alexa Hammer, and my service was born. Alexa’s wedding led to her sister, Alicia’s wedding and the rest is a marriage made in heaven! In 2014 this service got a name, I DO I DO I DO, and designing of the website began. On January 1, 2015, I officially had my first client, the lovely Lori Levine, as I DO I DO I DO! I love what I do for my Brides! Taking care of them, their wedding gowns and making their photo sessions “magazine perfect” is a special privilege that I take very seriously. Being a fly on the wall on such a special day, seeing the love and joy, makes my job not even feel like work. Please take a look at the Services page and see all of the different ways I can assist you from your engagement to you honeymoon. I have a few trusted friends in the industry that you may need too. Go to the Recommended Vendors page and check them out. Don’t forget to say you heard about them from I DO I DO I DO. No wedding is too big or too small. There is a service for everyone and every budget. It is a great gift to give a Bride you know! Browse the site, tell a friend and stay in touch with us through social media. When you say yes, come to I DO I DO I DO! http://idoidoidony.com/wp-content/uploads/2015/01/iDo-Logo-retina.png 0 0 Sadia Seymour http://idoidoidony.com/wp-content/uploads/2015/01/iDo-Logo-retina.png Sadia Seymour2015-01-16 21:09:152018-06-26 17:16:11Welcome to I DO I DO I DO!